Single people, mommy bloggers and those who have better things to do waste time in the kitchen will appreciate this. As mentioned in a previous post, I’ve taken a liking to cooking my own meals and stashing it in my freezer to preserve it for weeks on end. When I started out on this freezing kick, I made myself soups – lentil and butternut squash. They were relatively quick and simple to make and pretty tasty, if I may say so myself. Even though they were marvelous, I got sick of eating liquid lunches and dinners day in and day out pretty quickly. I needed to widen my cooking repetoire. The most logical thing to make, to me at least, was chicken. Who doesn’t love chicken, other than vegans and vegetarians? I wanted my chicken to be tasty, versatile, economical and quick and easy to cook. This led me to prepare chicken strips. I went to my local Loblaws bought myself a set of chicken breasts, on sale of course (always buy your chicken on sale). The set cost me about $8 for 4 good-sized pieces. I started the process by butterflying the chicken, a cutting technique I recently learned about. Basically, butterflying means you cut the chicken in a cross-section manner. 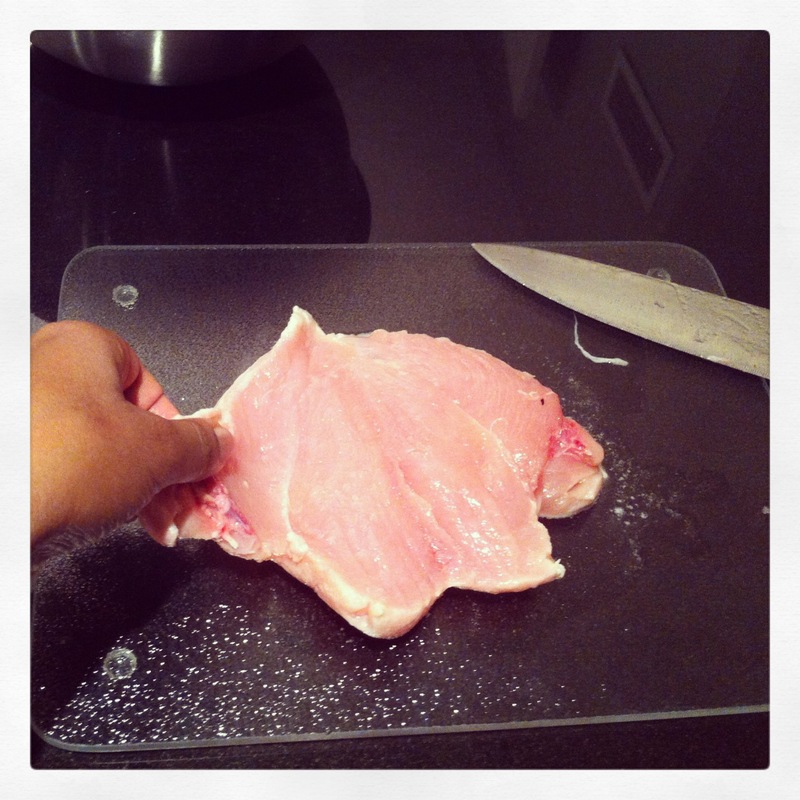 By doing this, you get more out of the chicken breast by making it thinner, which also means it cooks that much faster. 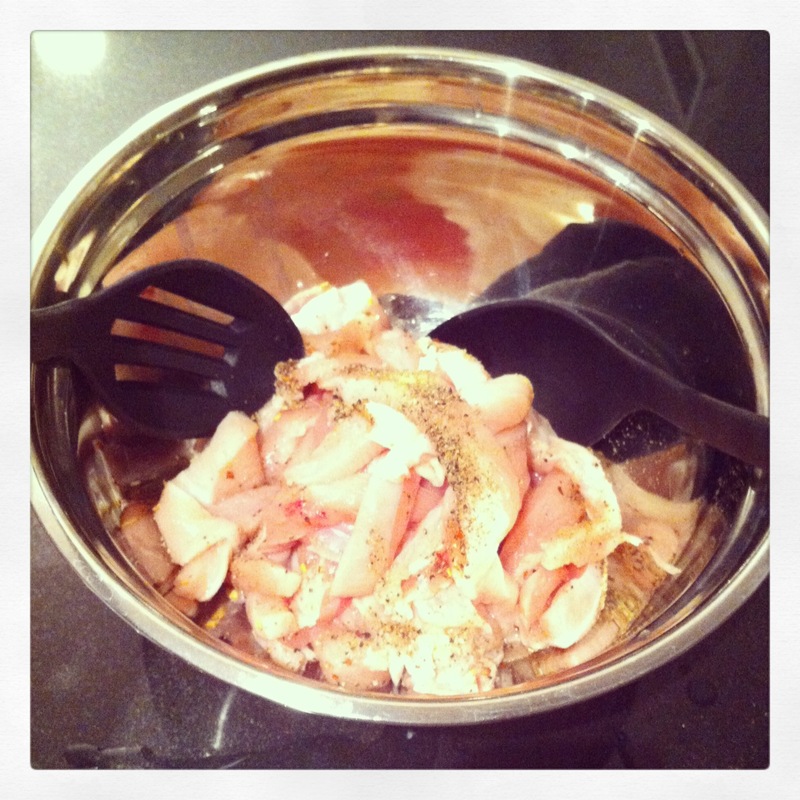 I cut each piece of chicken in a manner the culinary experts out there might cringe at – with my kitchen scissors. Yes, it’s a little crude, but it gets the job done effectively and quickly, and that’s all I really care about. I placed the cut-up pieces in an aluminum bowl. I put in a dash of garlic powder, black pepper, dried chili pepper flakes, some marjoram and a splash of balsamic vinegar and mixed it all up. That’s right, I keep it as simple and easy as I can, no measuring spoons here. People who measure out the precise amounts of seasonings have way too much time on their hands! 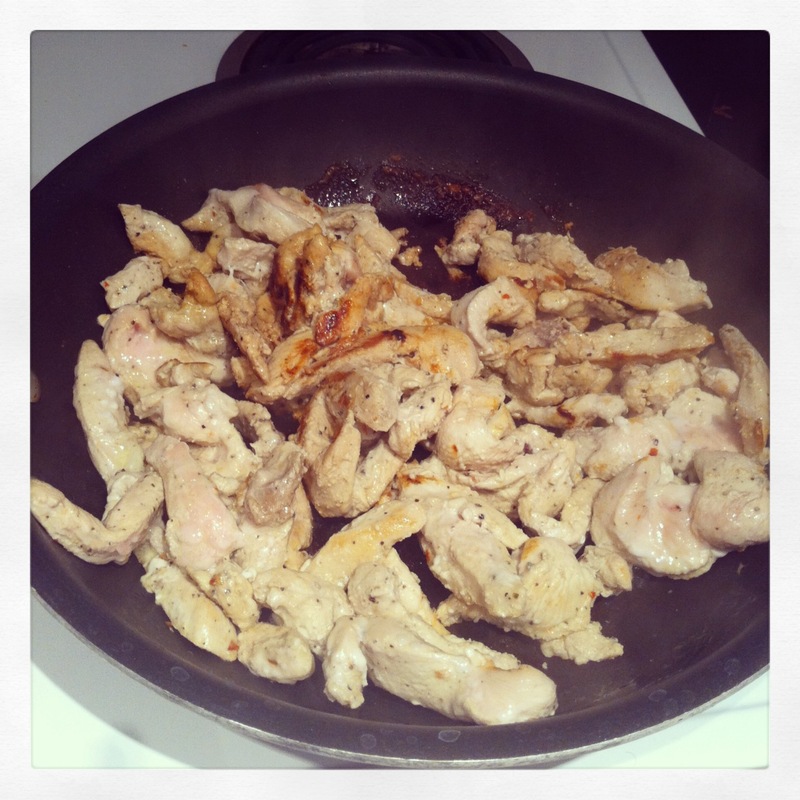 I threw my chicken on my preheated, olive oil-lined skillet. I tossed it around, checking it every so often to make sure it was sans pink spots. After about 7 or 9 minutes, it was fully cooked with a nice brown to it. I let it sit for a little while, I’d say about 20 minutes, to make sure it cooled down. When it was ready, I apportioned it sandwich bags. 8 bags of cooked chicken were yielded. Before I zipped up each bag, I tried to eliminate as much air as possible. I but these 8 bags in one medium-sized freezer bag and shoved it in my freezer. The entire prep time, from cutting the chicken to dumping it in the freezer took less than an hour. 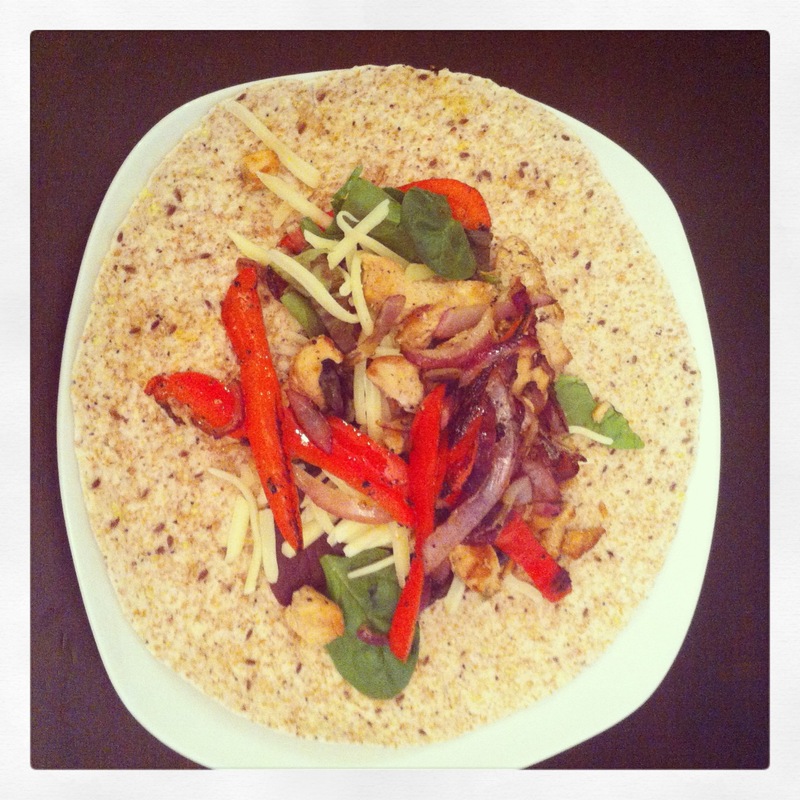 The next night, I took out a bag of my handy-work, warmed it up and made a delicious chicken wrap with it. 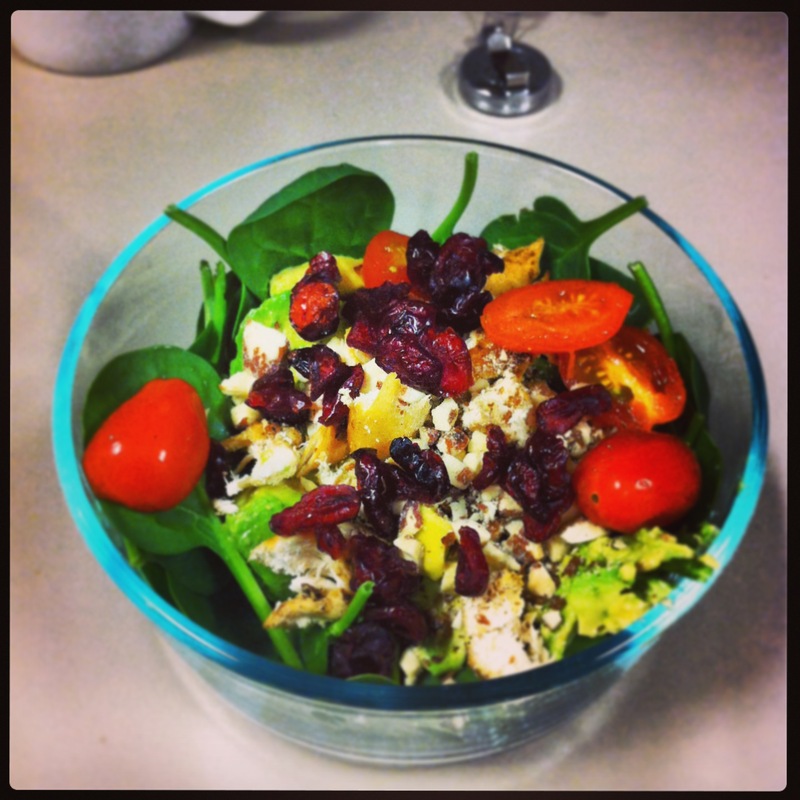 For lunch the next day, I made a sumptuous chicken salad, topped with almonds and dried cranberry, of course. Affordable, healthy and quick. The prep time for these meals took about 7 minutes each. That’s no time at all! And it also cost me a fraction of what it would if I bought it a a take-out restaurant. As a single woman living in downtown Toronto, there are about a thousand things I’d rather be doing than cooking. And even more, there are about two thousand things I have to spend my money on. 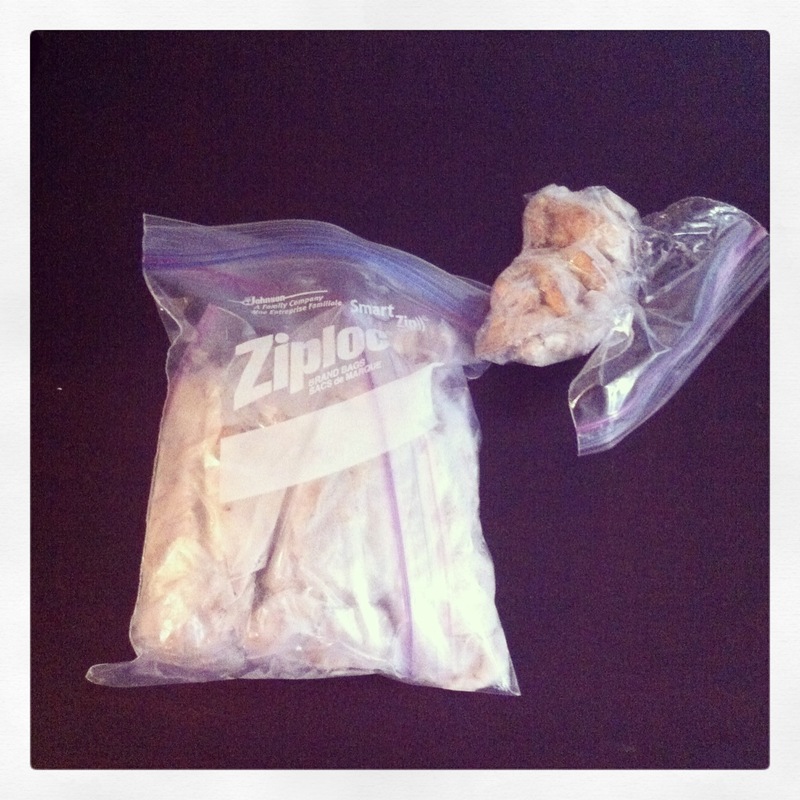 Time is money, so by preparing and freezing my own food staples, I’m saving on both. If I had a family and was nice enough to cook for them, this is the only way I could see myself doing it. Could you imagine having to cook a meal from scratch for hyper children after a long day at the office? No! I’d go insane. Ain’t nobody got time for that on the weekdays, and I definitely wouldn’t have the desire. I like to keep things simple, so I typically just make wraps and salads, but there are a multitude of meals you could make with chicken. 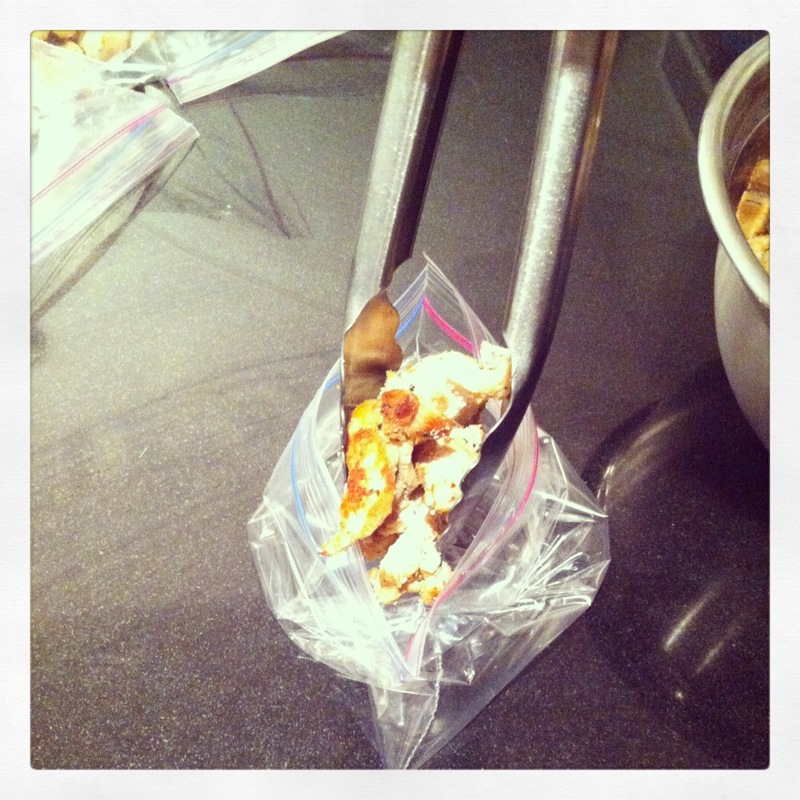 Store the chicken in whatever container makes the most sense for you – I choose small bags for portion control and because I’m not heating up too much at a time generally. For a family or heavy eaters, it would make more sense to store it in large glass containers. The type of food you make doesn’t even matter. Make chicken or don’t make chicken. Make whatever you want, as long it can stand being frozen and reheated, your good. I know, I only thought it a few months ago! Before I would just freeze the individual chicken breasts and cook them one by one. By the time the chicken defrosted, I was too hungry to eat it for dinner and I’d end up getting takeout. This new approach is sooo much easier!